Join us for a two-part workshop on Venezuelan song and percussion with master musician Jackeline Rago! For women, trans and gender non-conforming folk of all musical levels. 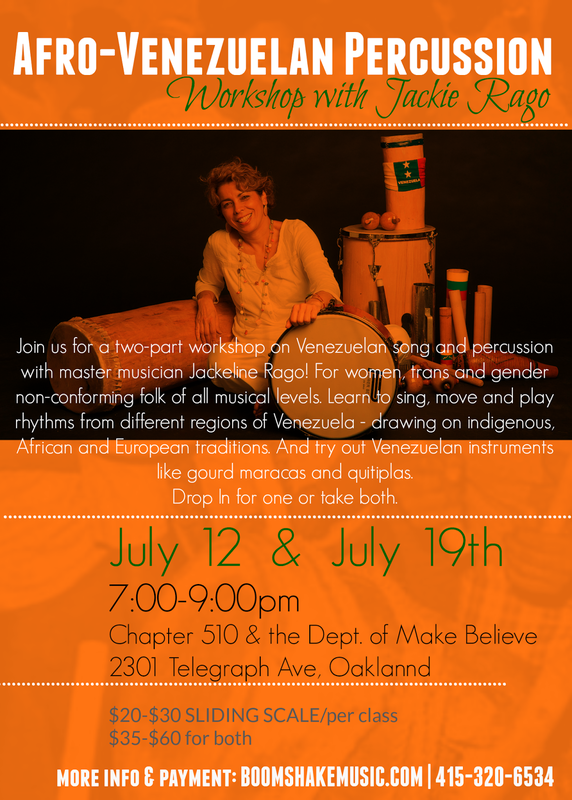 Learn to sing, move and play rhythms from different regions of Venezuela - drawing on indigenous, African and European traditions. And try out Venezuelan instruments like gourd maracas and quitiplas (bamboo tubes). You can drop in for either class individually, or take the two together. Bring a friend! Jackeline Rago is a multi-instrumentalist, composer, arranger, producer and educator who specializes in Venezuelan Folk-Music as well as music from other countries of Latin America and the Caribbean. Born in Caracas, Venezuela, Jackeline began playing music at the age of four. Prior to moving to the United States, she spent years studying the Folk-Venezuelan “Cuatro” (national string instrument) and mandolin at the “Manuel Antonio Carreño Primary School” under the tutelage of Venezuelan folklorist Angel Guanipa. During her teenage years, she completed studies in music theory and harmony at the “Escuela de Musica Prudencio Esaa” and courses in classical mandolin at “The Caracas Philarmonic Orchestra Conservatory” under maestro Ivan Adler. While in Venezuela, Jackeline also pursued studies in Afro-Venezuelan percussion under folklorists Hector Pacheco and Alexander Livinalli from the “Fundacion Bigott” in Caracas. In 1989, Jackeline graduated with a B.A. from the Music & Arts Institute of San Francisco, CA, majoring in classical mandolin. Presently, she resides in the Bay Area which has been her home base for the past 20 years. In addition to her Cuatro and mandolin expertise, Rago is an accomplished percussionist and vocalist.